It includes 39 plugins in 29 files, 1 palette file, and 45 shapes. This allows you to pick and choose to install only the effects you want. Then, later you can run the installer and uncheck an item to uninstall it. When you see in this post, you can click it for more information (including source code in some cases). To install, download this file to your Desktop, unzip it, and run the install program. click for more info! so anything you can spare would be much appreciated. Which of my plugin packs is right for you? You need to look at the paint.net version number in the title bar. 4.0.x You're in the right place. The download link is above, surrounded by blue arrows. 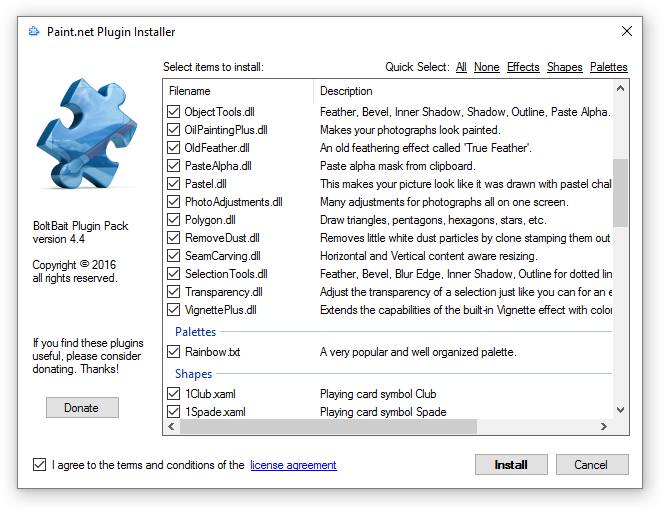 This plugin pack now includes an installer. Download the zip file to your desktop, unzip it, and run the installer. Also, all plugins now include a help file. Once you run an effect, click the [?] button in the upper right corner of the effect's UI (near the red X button). Note: All plugins in this pack have been tested with Paint.NET v4.0.6 release AND the most current release. Color Balance Easily adjust the tint of an image. Useful for color correcting photographs taken indoors without flash. The difference between this and the built-in Hue/Saturation adjustment is that this one will affect black and white areas. Hue/Saturation+ Conditional Hue / Saturation effect. Temperature/Tint Temperature / Tint effect. Transparency Adjust the transparency of a selection just like you can adjust it for an entire layer. Dream This makes your picture look like it was seen in a dream. + Oil Painting+ Makes your photographs look painted. Pastel This makes your picture look like it was drawn with pastel chalk or water color paint. From Clipboard Fills the current selection with the graphic on the clipboard. From File Fills the current selection with a graphic file. Bevel Object This effect allows you to make objects 3D. Works great with text! Feather This effect softens the edges of objects. Inner Shadow Renders a shadow on objects so they look like they have been cut out. Object Shadow Renders a shadow behind objects. OldFeather "True Feather" is back! So many people have asked for this that I'm bringing it back for this pack. Enjoy! Level Horizon Rotate an image by drawing a line across the horizon. Meme Maker Create your own Memes. Remove Dust Removes little white dust particles by clone stamping them out. I find this very helpful when scanning photographs. Sharpen Landscape Makes your landscape photographs look like they belong in a magazine! Seam Carving - Horizontal Reduce the height of an image without scaling (squishing) the image. Seam Carving - Vertical Reduce the width of an image without scaling (squishing) the image. Vignette+ Extends the capabilities of the built-in Vignette effect with colors and the ability to render a vignette to a blank canvas. Polygon / Stars This effect allows you to render triangles, pentagons, hexagons, etc. It also allows you to render stars. It is useful in making standard shapes and the pointed edges of stickers. Flames This effect allows you to render flames. It is based on Tom Jackson's excellent fire tutorial. Gradients Render colorful HSV (rainbow) gradients. Grid / Checkerboard Create checker board or grid patterns. Effects in this menu perform their effect by following the selection outline (marching ants). While they will work with a square selection (or no selection by using the edges of the canvas as their path), they are more interesting when the selection is curved , selected by hand , or by magic wand . Bevel Selection This effect allows you to make selections 3D. Works great with text! Feather Selection This effect softens the edges of your selection. It works just like the feather in other graphic$ program$. Inner Shadow Selection Renders a shadow on the inside of a selection so it looks like it has been cut out. Outline Selection This effect allows you to outline a selection. Floyd-Steinberg Dithering This effect will reduce the colors of your image using the Floyd-Steinberg dithering technique. I have also included my Rainbow Palette. This is very popular on the forums. 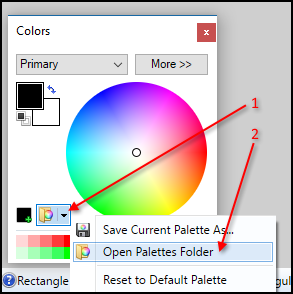 In the Color docker window, click the :ColorPalettes: button and choose Rainbow from the list. This plugin pack also includes 45 custom shapes. Post on this thread and tell me what your favorite plugin is. 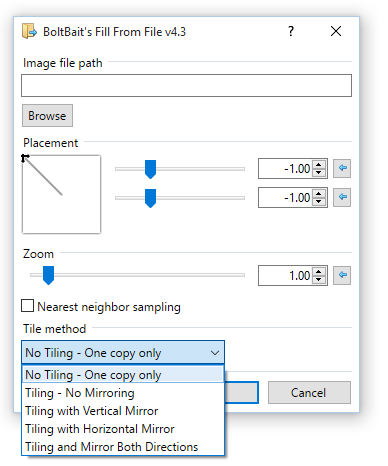 Fill From Clipboard and Fill From File got a "Tile image" methods. And, the [+] control now works as expected. Thanks goes out to MJW and midora for the mirroring code. Please give me feedback on the built-in help files. Too much? Not enough? Just right? This is the first rev, so let me know! Just updated. I like the new help files. I think they will be a great help to anyone new to PDN. Not too complicated but still useful. Love this pack thank you!!!! The "INNER SHADOW" and "FEATHER" effects show up in my EFFECTS>OBJECTS directory...AND in my EFFECTS>SELECT directory. I'm not sure why. I have 3 identical feather icons in the "OBJECTS" sub directory and one in the "SELECTION" sub directory. Each have different names on the dll files and thanks to his very nice PLUNGINS DIRECTORY plugin I can better identify plugin issues. and thank you for the really nice plugins. The menus give you a hint on how these are different. OBJECTS are pixels surrounded by transparency - like text on it's own transparent layer. Plugins in this menu require a transparent border to work their magic on the opaque bits and edges. SELECTION plugins work on an active selection. You need to make a selection prior to running the plugin. If you read the first post above you'll see that there are multiple versions of Feather; Feather, Old Feather and Feather Selection. Each works slightly differently. I have just updated my plugin pack. I have written a proper installer. This means, no more copying dll files to the paint.net folder... let the installer do it for you. Oil Painting+, a NEW EFFECT! It makes your photographs look like they've been painted. I think the results are better than the built-in oil painting effect. 45 Custom Shapes. I have combined my shape pack with my plugin pack. Now, get everything in one place. Please note, if you've previously downloaded my shape pack, delete it from the paint.net shapes directory before running this installer. I have changed the filenames of all of my shapes. Sorry for that, but this makes it much better going forward. Click 1, then 2. This will open a folder. Once opened, you can close it and close paint.net before running the installer. I just wanted to say thank you for all the Effects, Palette, and Adjustment plugins you have provided over the years. 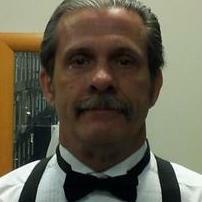 I am a technical writer and use PDN exclusively for all my graphics work. It would not be nearly as effective without all your hard work. I hope your financial situation improves soon (been there, done that, multiple times). I installed the transparency effect from the pack, and it works beautifully. It's interesting that Paint.Net can't do this itself, but your plug-in can. Thanks so much. Time to say thank you for this pack of plug-ins - My list of plug-ins is growing by leaps and bounds. I˝m downloading more than I am creating. Kudos again to you sir. It even allowed me to start a gallery. Installed the 4.6 pack at your suggestion on my thread on Need Multiple Adjustment or Effect Controls active simultaneously. Here are my hopefully constructive comments and suggestions, but only on the "Combined Adjustments" plugin (except for Item 1). 1. Perhaps just my paranoia, but it would be nice to have the option of just copying the appropriate files into the appropriate sub-directories of the Paint.net installation, i.e., a zip file of the actual files to be copied along with a short readme file on where to put each one. I just don't like to run .exe files where they're not really necessary. By all means include the .exe option as well for those who prefer a one-step "no-brainer" installation. 2. A "Reset All" button and a "Preview/View Original" checkbox are needed. 3. I find it odd and somewhat disconcerting that the default values (with everything reset) has Noise Reduction at 0.2, Brightness -10, Contrast +10, Saturation +5 and Final Multiply Adjustment (more on that later) 30, i.e., it's already modifying my photo without my doing anything. The reset values should always default to "No Change" on a general function like this. If you feel that these are "Typical" values that most photos need (though I would disagree), then by all means add a "Typical" button with these "standard" values, but the Reset values should really reflect "no change." 4. The Help file is great, but I would really like more detail in it, specifically on the algorithm being used (even in general terms in the case of more complex algorithms). Even a casual user might find it useful or at least interesting, and the more technical user may actually want to know what exactly is being done to the image. Perhaps Brightness and Contrast don't need more explanation (though even there, a one-liner like "adds the specified number to each of the RGB values, within the range 0-255" would be useful). Of course those who would like even more detail could go to the source code, but this would be a nice intermediate step. Another useful item would be whether an item like Saturation just calls the built-in Saturation control function or whether it is a (perhaps differently operating) replacement. In the case of Noise Reduction, for example, where the built-in has two controls Radius and Strength and this Plugin has only one (Strength, presumably, but with a different default of 0.2 to boot), it would be especially useful to know what's being used as the default "Radius" parameter in this case. 5. "Final Multiply Adjustment" really does need a detailed explanation. The current "really bring out the dynamic range of your image" doesn't really say much (in one of my photos that I tried this out on, it actually reduced the apparent dynamic range). The name suggests that it multiplies each of the other adjustments by some factor, but even if I set all the others to 0 (manually), this control still does something to the image. 6. Shadow/Highlight Recovery: With the same three controls as in just the Basic portion of Tanel's plugin. 8. Add "Auto Adjust" button that uses some algorithm to make (proposed) changes to the included functions automagically, showing on the sliders what changes were made (so the user can use as a starting point and further modify). 9. Noise Reduction: Add Radius parameter as well to match the built-in. You're new around here so you don't remember that we used to have a dozen posts a day asking how to install plugins. That's why I wrote the following web page: http://boltbait.com/pdn/InstallingEffects.asp so a dozen times a day I would point them to that page. It still took up a lot of time and people still had a problem following the instructions so we had to answer multiple posts per day about this. At this point, I wrote the plugin installer and gave the source code away to anyone who wanted it. (I have not posted it publicly as I don't want the megalo people to get their hands on it.) It handles plugins, custom shapes, palette files, and other support files. And, only takes about 15 minutes for a programmer to create one from their dll files. We now have nearly zero daily posts about installing plugins... I'm never going back to the dark ages. Deal. Not possible, sorry. This is a limitation of the paint.net indirect ui system. a "Preview/View Original" checkbox are needed. I can add that. Good idea, thanks. 3. I find it odd and somewhat disconcerting that the default values (with everything reset) ... it's already modifying my photo without my doing anything. Many of the built-in effects do this. For example, Gaussian Blur has a default of 2. Some of the Adjustments do, some don't. I'll have to think about this... but, my initial thought is to have the effect actually do something when first run. This is a fair assessment. I wrote all my help files at a very high level thinking that I would go back later to add details. Maybe it is time for me to revisit them. 5. "Final Multiply Adjustment" really does need a detailed explanation. The multiply section simply takes the resulting pixel and multiplies it with itself. Therefore it makes brighter pixels slightly brighter and dark pixels slightly darker. It is the same as if you duplicated a layer and changed the top layer's blending mode to Multiply then started adjusting the Opacity slider. 6. As Tanel has posted the source code to his Shadow/Highlight Recovery plugin, this is possible. 7. Not possible as the histogram controls are not available to us plugin authors. 8. Again, not possible. That's why the defaults of the sliders are somewhat general. 9. The noise reduction Radius slider make so little difference, I just hard coded it at 10. I prefer smaller UI's when possible. What do you think? Worth doing? > We now have nearly zero daily posts about installing plugins... I'm never going back to the dark ages. Deal. Ok, deal. Was a minor point, and certainly appreciate the counter-argument. > Not possible, sorry. This is a limitation of the paint.net indirect ui system. But could have sworn I've seen it in others. Yes, in fact the Shadow/Highlight Reduction Plugin has a Reset button that resets all 3 sliders (in the Advanced mode it even resets sliders on Tabs not visible). >> a "Preview/View Original" checkbox [is] needed. > I can add that. Good idea, thanks. >> 3. I find it odd and somewhat disconcerting that the default values [are] already modifying my photo without my doing anything. > Many of the built-in effects do this. For example, Gaussian Blur has a default of 2. ... I'll have to think about this. I feel more strongly about this one, that given the nature of this plugin as a general-purpose one the reset default really really should be "no change." You are absolutely right that in cases like Gaussian Blur, Convert to Black+White, and other specific-single-function plugins, a default that does something makes sense since anyone who invokes that function wants to see a Blur, B/W, etc. But in this case, as a Combined Effects plugin, it is way too general purpose to have any reasonable default. In cases like Brightness and Contrast, there is absolutely no way of knowing whether someone wants to increase it or decrease it (the built-in Brightness/Contrast controls do default to 0, by the way). If I invoke Brightness, I almost always want to increase it, but your default would decrease it. Really, most of the time I don't need to touch it, and it's the control I would use most often. The FMA "Squarer" function, while interesting, is non-standard enough that I would never really be likely to use it (preferring instead the more linear white/black point adjustments and that too on the rare occasion I even need dynamic range increase), yet it has a default of 30. Do reconsider this! > I wrote all my help files at a very high level thinking that I would go back later to add details. Maybe it is time for me to revisit them. > 6. As Tanel has posted the source code to his Shadow/Highlight Recovery plugin, this is possible. > 7. Not possible as the histogram controls are not available to us plugin authors. I'm going to expound on this one at some length as well. The interactive histogram, while very useful, is really icing on the cake. And recreating all the functionality I described from scratch including all the histogram stuff is admittedly complex and reinventing the wheel. But yet, if no white point and black point adjustment controls are available to plugin authors even without the histogram, it's still a relatively simple function to recode, is it not? It's just a linear rescaling of the brightness value of each colour of each pixel between the new white point and black point values, after thresholding, true? I usually use this adjustment partially in lieu of, and generally in complement with brightness and contrast (hence my wanting it in the Combined Adjustments), often for an underexposed photo (less frequently for an overexposed photo which can generally not be improved upon as much). The histogram in this case shows almost no pixels on the white end of the spectrum, so I dial the white point down to a point close to where the histogram starts to show activity, knowing that I am losing very little information by doing so as very few pixels are being destroyed (converted to all-white). But even without the histogram, just looking at the picture I can tell from the lack of light tones that a white point adjustment is worth trying and similarly a black point adjustment in the case of a lack of dark tones. So I'd still find it useful even operating the control "blind." So if you can recode just the controls, this would still be useful. But yeah, it's somewhat more useful with at least an input histogram too. Would just a b/w input-only histogram be too much to ask to recreate? > 8. Again, not possible. That's why the defaults of the sliders are somewhat general. OK, this is not a big deal for me. It was educational when I first started photo editing as a quick way to see what controls did what, but I rarely find a need to use it nowadays even on programs that support it. (But I'd still insist that zero-level defaults are better in that case ... not to harp on that point or anything ... .) If at some point in the future it becomes possible, my discussion above on white/black points provides a basis for an algorithm for the auto-setting of those two parameters at least. > I would have to trade out Noise Reduction for Shadow Recovery. > What do you think? Worth doing? No issue on my side with trading out Noise Reduction for Shadow Recovery. Not because Noise Reduction isn't useful, but because much less is lost by having it be an independent control as its effect is largely orthogonal to the others. Now if you could add a basic (histogram-less) White and Black Point adjustment to the above list per my comments above, I'd be a very happy camper! Not being able to reset all the controls with a single button is a limitation of IndirectUI (as BoltBait alluded to in his response). Any effect with tabs isn't using IndirectUI. Most PDN plugins use IndirectUI, because it's considerably easier than implementing the user interface from scratch, and it assures a consistent look-and-feel. Thank you so much, I wish I could donate to you. Threat type: Heuristic Virus. Detection of a threat based on malware heuristics. Dump Norton's worthless virus checker and use Windows Defender. Norton does sometimes cry wolf. In the lower-right corner of the Norton file-warning window (in rather small letters), there's a Restore link. Click on it to restore the file Norton quarantined. Update to the plugin pack today! 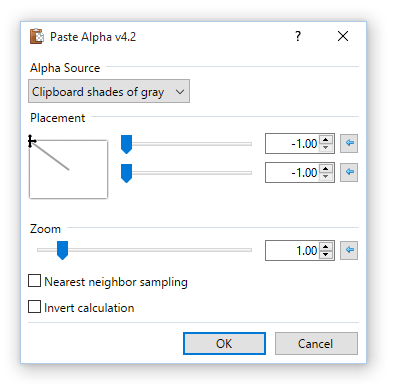 Object > Paste Alpha - added a "Paste Method" choice to handle different types of alpha masks. Photo > Combined Adjustments - Replaced sharpen function with shadow recovery function. When the installer first runs, it updates the check boxes to what's currently installed. However, if nothing is installed, it automatically checks ALL the boxes (figuring the user would like to install everything). For high volume network managers: Plugin Manager has a silent install function... for more information: install /? I used the new Paste Alpha "paste method" options a number of times when making my "Knight Shield" OOTF entry. I hope people try it out and discover how useful it is for combing alpha masks with images that have non-opaque alphas. Windows Defender claims that there is a trojan in the zip file, called Win32/Tilken.B!cl. Yes. This is a false positive. Feel free to send the file to the defender team so they can fix their detector.